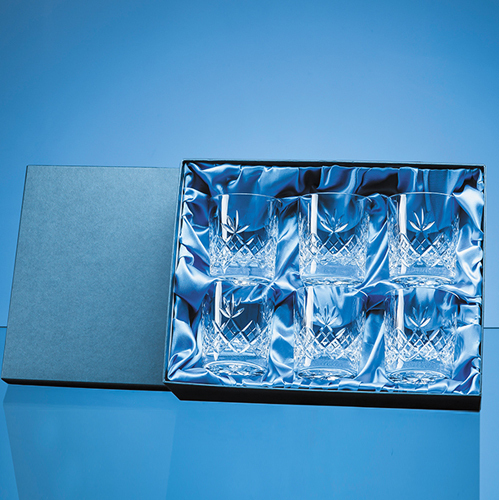 This gift set of 6 x 300ml Blenheim lead crystal whisky tumblers will last the test of time. With traditional straight sides and a classic diamond and wedge cut design these whisky glasses will double as water or juices glasses on an elegant dinner table. Perfect as a business award or a gift for any occasion from birthday, wedding, engagement or retirement  the choice is entirely yours. What you can be certain of is that they will look splendid in their stunning presentation box with blue satin lining, and will fit perfectly with other pieces from the Blenheim collection.